Olives are one of those foods that can range from simple to exotic—from a basic black to a vibrant green, from very mild to super salty. They can be eaten alone out of hand or incorporated into recipes. And in many cases, you either love or hate this small-sized fruit, or you may prefer a particular variety. It may surprise you to learn that the only difference between green olives and black olives is ripeness; unripe olives are green, whereas fully ripe olives are black. Because the raw green olives have a naturally bitter taste, they need to be cured; this can be done through various methods including oil-curing, water-curing, brining, dry-curing, or placing in a lye solution. As olives are the Mediterranean in origin, most varieties come from Spain, Italy, Greece, and France. In addition to the difference in their state of ripeness, there are other distinguishing characteristics when it comes to packaged green and black olives. Bottled green olives are usually pitted, and often stuffed with various fillings, including pimientos, almonds, anchovies, jalapenos, onions, or capers. Canned black olives are graded into sizes labeled as small (3.2 to 3.3 grams each), medium, large, extra-large, jumbo, colossal, and super colossal (14.2 to 16.2 grams). Black olives also contain more oil than green olives. Depending on which method is used, curing olives can take from a few days to a few months. Lye curing has the shortest fermentation time while brining takes the longest. Green olives must be soaked in a lye solution before brining, whereas ripe black olives can proceed straight to brining. The longer the olive is permitted to ferment in its own brine, the less bitter and more intricate its flavor will become. There are many types of olives, but you may come across just a few in your local supermarket or gourmet grocer. The Manzanilla is a Spanish green olive that is lightly lye-cured then packed in salt and lactic acid brine. These olives are most often available pitted and sometimes stuffed. Another Spanish olive is the Gordal, which means "fat one," a fitting name for this plump, rounded green olive. They are meaty and rich tasting, and often served as a tapas. A French olive you might find is the Picholine, a salt-brine cured green olive with a subtle, slightly salty flavor. In the U.S., they are sometimes packed with citric acid as a preservative. Cerignola, Italy, produces a green olive by the same name. It is large in size, buttery in flavor, and crisp in texture. Black olives aren't just plain and found in a can; there are plenty of interesting cured black olives to choose from, such as Italian olives. One is the Liguria, a black olive that is salt-brine cured with a vibrant flavor, and sometimes packed with their stems. Another Italian black olive is the Ponentine, salt-brine cured and then packed in vinegar; it has a mild flavor. The Gaeta is also a ripe olive; it is dry-salt cured and then rubbed with oil. It has a wrinkled appearance, mild flavor, and is often packed with rosemary and other herbs. And one black Italian olive that is popular at tastings is the Lugano; it is usually very salty and sometimes packed with olive leaves. Perhaps a more common brine-cured olive is the Kalamata, a Greek black olive that is harvested fully ripe. It is a deep purple color and almond shape, with a rich and fruity flavor. The French Niçoise olive is also often found on the olive bar; this small black olive has a rich, nutty, and mellow flavor with a high pit-to-meat ratio. It is a bit wrinkled and is often packed with herbs and stems intact. Once you bring home these delicious olives, you need to make sure you store them properly to maintain their freshness and flavor. 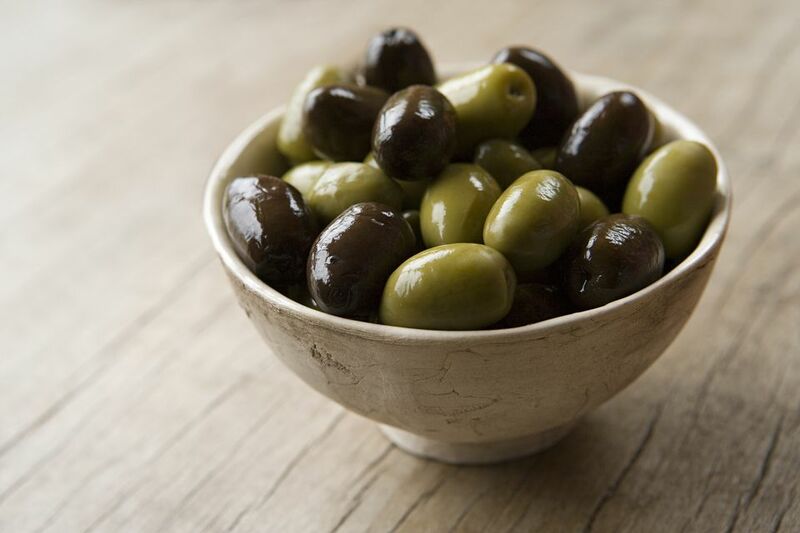 Unopened olives can be stored at room temperature up to 2 years. Opened olives (including those from an olive bar) should be refrigerated in their own liquid in a non-metal container and will last for 1 to 2 months after opening.